Posted by Shelley Grell on March 12th, 2013. 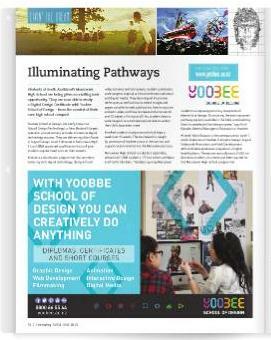 Press release, 12 March 2013, YOOBEE School of Design, Christchurch, New Zealand: Yoobee School of Design is now delivering its Digital Design level 3 (iCreate) course at South Auckland’s Manurewa High School. Enrolled students study one and a half days a week over 35 weeks and gain a New Zealand Qualifications Authority (NZQA) approved level 3 Certificate. Coursework is taught by professional Yoobee tutors in the familiar and supportive environment of the Manurewa campus. The initiative is part of the high school’s Business Administration Academy. Read the media coverage: Manukau Courier, The Aucklander, Independent Tertiary Institutions, Tearaway, Eduvac, Tomorrow’s Schools Today, ED Blog.